"From Different Worlds They Come To Prove Themselves In The Gritty World of College Football." 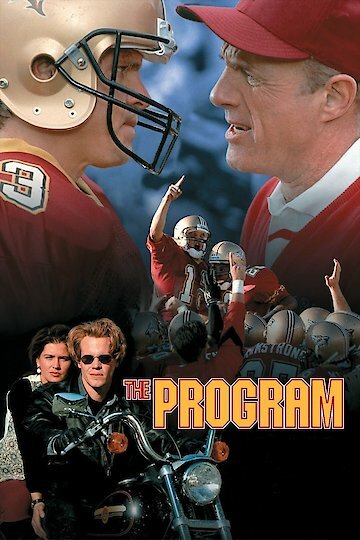 James Caan portrays plays head coach Sam Winters, who runs a top-ranked college football powerhouse in the sports drama The Program. Coach Winters rules his football program with an iron fist; he has a win-first-and-ask-questions-later attitude towards his players, and the leadership and boosters at ESU University put pressure on the coach to consistently field a winning team. Coach Winters isn’t the only one that feels the pressure. Quarterback Joe Kane is also under pressure. After a fantastic year that ended in a bitter loss, Kane is a frontrunner for the Heisman trophy and deals with that pressure, as well as the pressure of living with and alcoholic father and brother. When the pressure gets to Joe, he turns to the bottle as well. For the upcoming season, Joe will have some help. Freshman running back Darnell Jefferson has come to play for ECU, and a senior linebacker, Steve Lattimer, who has been a perennial third-stringer, has gained pounds of muscle and wins the starting defensive end job. Darnell struggles with campus life, home sickness, tougher classes and a fumbling problem. He reaches out to a beautiful tutor, Autumn, whom he quickly has feelings for. The problem is that she is dating the team’s starting senior running back, Ray Griffen. Joe also makes a move for romance, attempting to seduce a fellow athlete in tennis player Camille Shafer. She falls for Joe but is scared by his drinking and his family history. The team starts the season with a win, but quickly trouble starts to brew. Jefferson pushes Griffen for playing time and for Autumn’s affections. Teammates discover that Lattimer has been using steroids, and he starts having bouts of rage. The pressure gets to Joe after a tough loss, and he nearly kills himself while driving drunk. Coach Winters tries to bring the team together to save his job and the futures of his players. The Program is currently available to watch and stream, buy on demand at Amazon, Vudu, Google Play, FandangoNow, iTunes, YouTube VOD online.